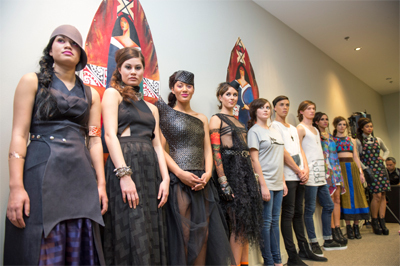 Miromoda Awards Media release – Kura Artist SHONA TAWHIAO Runner Up – Kura Gallery: Maori and New Zealand Art + Design. Miromoda is a combination of Maori and Italian languages, it could mean unpredictable because the entries in its annual fashion competition are usually unpredictable, but no, thatâ€™s not what the word Miromoda means. Miro is Maori for the traditional weaving term to twine fibres and moda is the Italian word for fashion. The brand was established in 2008; its genesis was always going to be Maori but the Italian word was purposely included for the brand to be recognised internationally â€“ something that Miromoda cofounder Ata Te Kanawa says is happening in 2012.
â€œWe have received healthy interest from Europe, particularly Holland, Germany and France which poses an interesting, exciting, and huge challenge for us,â€ says Te Kanawa. Coincidentally, Miromoda also contains the words Maoridom and mod Maori â€“ neither of which the creators realised at the time of the brandâ€™s development. Miromoda is now in its fourth year; last weekâ€™s competition in Wellington, which is open to aspiring Maori Fashion Designers from throughout the country as well as internationally, saw 26 entries judged by an astute panel including founding Director of NZ Fashion Week, Dame Pieter Stewart, Publisher Jack Yan, former European fashion buyer and retailer, Anthony Morsinhof and Communications Executive and fashion enthusiast, Paula Collins. Seeking winners and runners up from four categories, judges found themselves perplexed as to whom should earn a place in the Miromoda Showcase at Aucklandâ€™s NZ Fashion Week in early September. â€œThe standard continues to step up each year, and the stories behind the concepts are incredible,â€ said Stewart, who had just returned from Europe combining a holiday with attending international Fashion Weeks. In her absence she was honoured with a Dame Companion of the NZ Order of Merit in the recent Queenâ€™s Birthday Honours. Organised as a closed off Project Runway-styled competition, each designer is assigned models â€“ complete with catwalk makeup, hair and shoes â€“ to present their collection and must in no more than ten minutes explain their design concept, the materials used, the commercial potential and target market to the judging panel. With the largest number of entries thus far and a broad spectrum of quality collections, judges were forced to be flexible in their selections to accommodate eleven designers, an increase on the usual eight collections, in the Miromoda Showcase at NZFW in September.